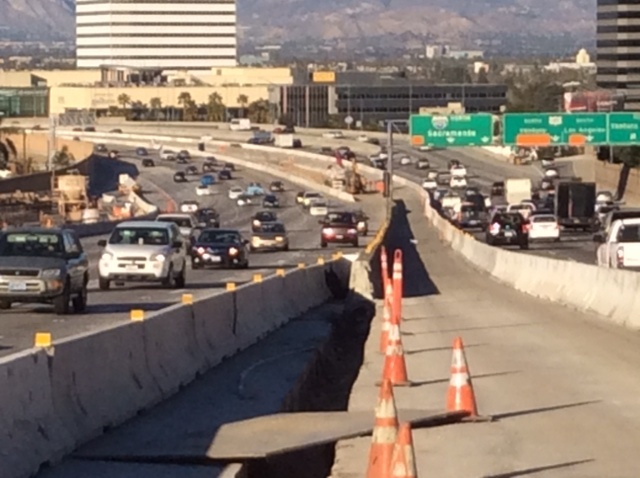 The Presidents’ Day northbound 405 paving operation will realign a portion of the freeway centerline to the west in the San Fernando Valley. Photo taken from project area on the southbound side of the 405. 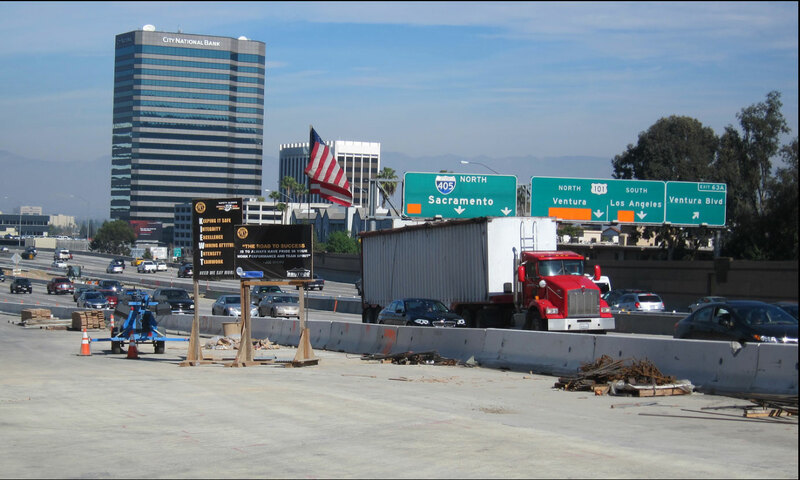 The planned 80-hour “Jamzilla” paving operation now scheduled for Presidents’ Day Weekend, February 14-18 is more complex, requires new construction and is more time-consuming than the epic “Carmageddon” bridge demolitions of 2011 and 2012. The I-405 Sepulveda Pass Improvements project contractor, Kiewit Infrastructure West, will not benefit from gravity in the frenzied destruction of an iconic freeway bridge. Instead, the contractor will take its time to pour a single layer of pavement at a time. 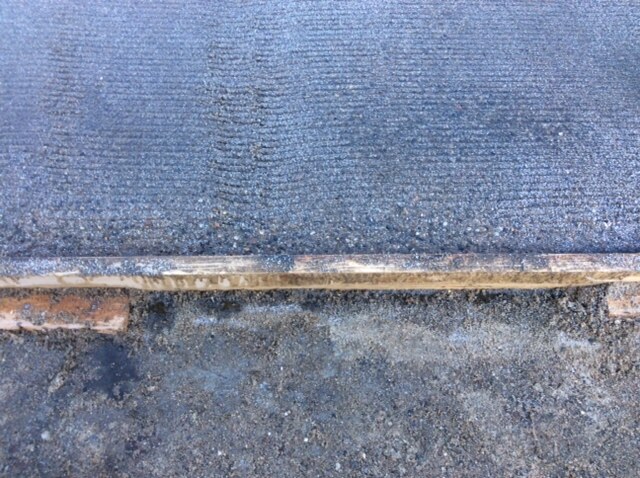 Each concrete layer takes its own time to cure. The operation is similar to baking layers of a wedding cake. A car drives on the unfinished No. 1 northbound lane that will receive a final pave during Jamzilla lane closures. The operation officially begins Friday night, February 14. 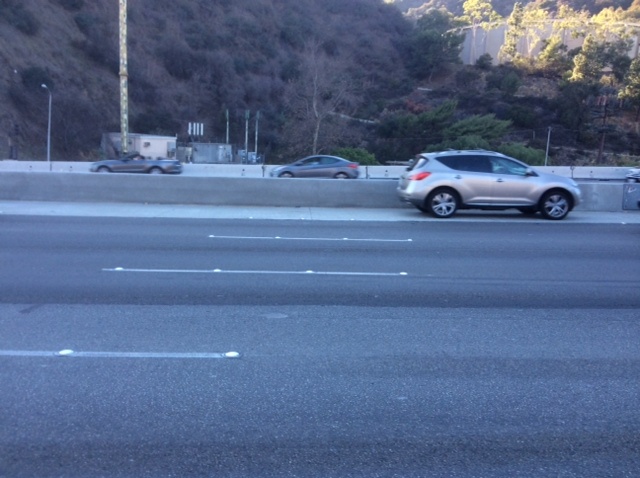 After a full northbound freeway closure at 1 a.m., Kiewit will begin excavating and paving multiple areas within the 5.6-mile area of the northbound I-405 in the Sepulveda Pass simultaneously. In order to complete as much paving work as possible, the contractor will use new polyester pavement that cures and reaches specified strength within hours instead of days, and provides an extremely durable roadway surface for the hundreds of thousands of vehicles that drive on the northbound 405 every day. But the operation depends on the weather. The polyester paving requires favorable temperatures in order to cure properly and give strength. If temperatures are less than favorable or if it rains, it could complicate the operation, or at worse, cause it to be rescheduled over several consecutive 55-hour weekend operations. Polyester concrete has quick-dry, high-strength properties and is very compact. The contractor will perform up to four separate paving operations during the 80-hour period on various portions of the northbound 405. The contractor must grind, tack, pave and stripe the freeway in a carefully choreographed sequence. Because the paving areas abut one other, the contractor will operate in a very confined work zone. Maneuvering construction vehicles within this area for all needed work will be a logistical challenge. Adding to the complexity of the operation, the contractor must shift the freeway centerline 20 feet to the west for approximately 1,000 feet as the northbound I-405 winds its way down into the San Fernando Valley. There was no room for the freeway to be widened to the east due to the existence of a multi-residential building adjacent to the northbound 405 in Sherman Oaks. 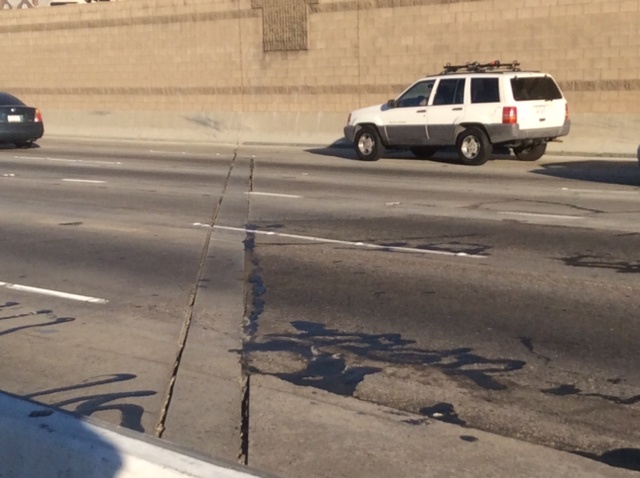 A 1,000 portion of the freeway centerline in Sherman Oaks must be shifted 20 feet to the west. Also in this area, approximately 1,700 feet of freeway and shoulder lanes must be completely excavated to full depths and rebuilt in order to realign the freeway to the west. The most complex work will occur where the northbound 405 meets the Sepulveda Boulevard undercrossing bridge just before the U.S. 101 connector ramps. The contractor must demolish and then rebuild the approach slabs on both sides of the freeway bridge to upgrade the slabs for seismic safety and roadway durability. This includes first building a seat to accommodate the new approach slab. The contractor must also reinforce the concrete with rebar for seismic safety and ensure the new approach slabs comply with state highway standards. Three concrete pours will be required to rebuild the approach slabs. Each of those pours requires its own 8-hour cure time. The extensive work required to rebuild these slabs drives the critical path for the entire 80-hour operation. The Sepulveda undercrossing approach slab has to be rebuilt. The new roadway surface will be much improved for motorists. Finally, when all paving and approach slab work is completed, the contractor will restripe the freeway prior to reopening lanes by 6 a.m. Tuesday morning, February 18. Compared to the flurry of activity of the Carmageddon bridge demolitions, this new paving operation will have little visual excitement. There will be periods during the 80-hour operation when concrete is curing where nothing appears to be happening. However, the contractor will still be working from a meticulous schedule to complete all tasks within the 80-hour period. 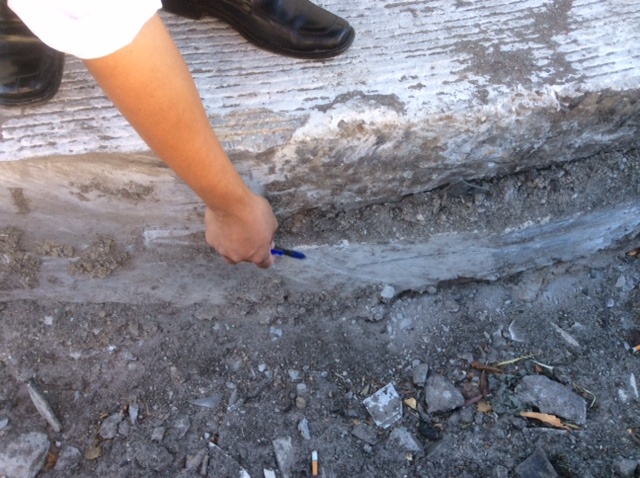 A Caltrans engineer shows a cross-section of freeway to indicate the multiple layers of needed paving during the 80-hour operation. Motorists are reminded to fully cooperate with agency calls to stay off the freeway just as they did during the previous Carmageddon closures. Motorists should eliminate unnecessary auto trips, avoid the area and/or divert to other freeways to avoid major traffic delays. Let’s not forget the end result of all this expensive and delayed construction – we will have an additional lane on the freeway that will be completely congested during peak periods – just like we had before the project ever started and we wasted $1 billion that could have gone to a more efficient mode of transportation – perhaps a rail line or even a bus lane connecting the Valley with the Westside. It’s sad that Metro spends time trying to sugarcoat this wasteful spending with cute names like “carmageddon” and “jamzilla”. In the end, we are simply allowing more cars to sit in traffic, and failing to provide hundreds of thousands of people with an ALTERNATIVE to this congestion. Metro needs to start focusing on completing an efficient transit network, not fruitless endeavors to supposedly reduce congestion by adding even more asphalt. I really dislike Jamzilla as a name. We all know the 405 closures should have names from the Apocalypse (Rampture, Carmaggedon, etc). japanese monsters should be reserved for issues on the 5.